The DR250 is the flagship of the DR line. At about 22 inches cubed, and weighing as little as 40 pounds, it is small enough to be easily transported, while its 106dB average sensitivity makes it one of the most powerful loudspeakers available. This high average sensitivity means hauling around half the number of cabinets you used to need, and half the number of amps to power them. I built the DR250 in the 4 piezo tweeter version. This cabinet works great as a bass cabinet. The sound is clear and sharp, very punchy and has nice, growling lows for this size. I can't see a need for Tuba at least in rehearsal use. This cabinet makes the floor shake with very low volume setting on my 130W amp. I don't even want to try how loud it can be! Thousand thanks to Bill for a great design and even better customer service on the Forum. The way this cabinet works made me build 2 DR200's for our band as vocal/keyboard cabinet. The DR250 is suitable for electric bass, keyboards or main PA. It may be built with tweeters for full range operation, or without, for a more traditional electric bass sound. The cabinet side profile is trapezoidal, allowing vertical splaying of multiple cabinets in a line-array PA configuration. The cabinet may be built with a sealed or vented driver chamber, frequency tuned for use with or without separate sub-woofers. And if you prefer compression HF drivers the DR250 can be loaded with a pair of Eminence ASD1001 drivers on a wide dispersion vertical horn array that delivers a full 100 degrees of usable horizontal dispersion. 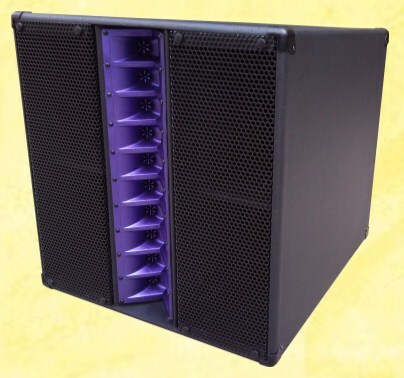 Energized by a single 250mm woofer, the DR250 can be built for less than $200, depending on driver, hardware and finish choices, yet it offers performance superior to commercial pro-sound loudspeakers costing hundreds, if not thousands, more. 34 Pages, 69 photos, 14 diagrams. Plans are $14.95, delivered within 24 hours as email attachment in MS Word format. PDF available on request.